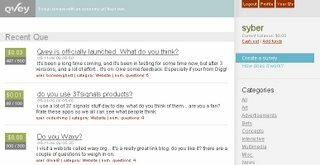 Qvey is a website which helps users to gather feedback easily. You can post Qvey to the home page of the site, and then other users answer those questions. The website says you can earn money if you want, but I did not try, I don't know how it work. More detail you can surf its website. Register is free.